Today’s cork tiles are manufactured almost exclusively using Water Base Contact Cement binders and finishes. This is to keep the VOC content of the product as low as possible. In doing so, the cork adhesives required to install glue down cork tiles must also be water based. Using solvent based glues (the cans with the skull and crossbones on them) will cause the binders in the cork to dissolve – resulting in “cork oatmeal”; a runny, gooey mess that can be cleaned up with a shovel and slopped into a garbage pail. 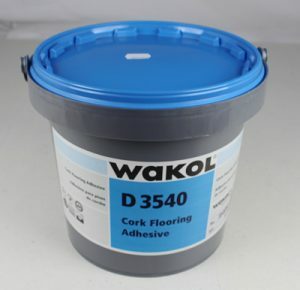 Water based contact cement adhesive is the go-to product for cork glue down tiles. The contact cement application is extremely important for cork. Contact cement application means that both the back of the cork tiles and the substrate (plywood or concrete) is coated with adhesive and allowed to “flash” or dry. This flash time is very important. Cork tiles can swell or warp out of shape if they are installed using a “wet stick” approach. Many cork floors have been ruined by installers attempting to use trowel on “wet” adhesives. When cork is left to dry for 12-24 hours with thick, wet adhesive, it can curl. This curling is not immediately evident. Many installers have trowelled on adhesive and set 300 – 500sf of cork tiles that looked beautiful. The next day the installer returned to discover 100% of the tiles had curled into a banana shape and “set” in that position. These floors had to be removed, discarded, repurchased and the installation attempted again. There is no way to salvage any cork tiles that have curled because of wet adhesive. Water based contact cement limits the amount of moisture a cork tile is exposed to. The layer of adhesive (as thick as applying mayonnaise to a piece of bread) flashes, or dries, inside of 60 minutes. This quick drying time ensures the tile never loses its shape. Once the adhesives have dried the tiles are then installed in a systematic manner. It is important for the glue on the subfloor to remain pristine. It cannot be walked on once it has been applied. For this reason, it works best to work in quadrants using chalk lines every second or third row to ensure the lay is straight. If it is not on this list, it should not be purchased prior to speaking with you r Forna Cork flooring Technical Support.